My good friend Stephen Leigh, who is a terrific writer, has a new book out, and so I invited him here to talk a bit about his work and his writing life. 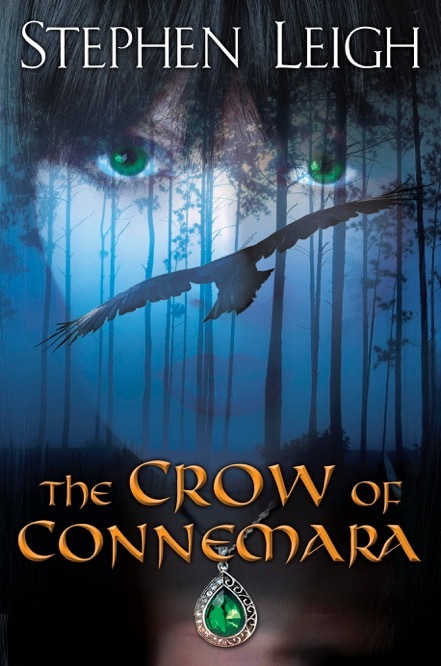 Why don’t you begin by telling us about your latest release, THE CROW OF CONNEMARA? What’s the book about? Where did the idea come from? And are there more books planned for the project? So many questions packed into one little paragraph! ☺ I’ll try to tackle ‘em one at a time. What’s the book about? Man, that’s always a question I dread, because it’s terrifically difficult (for me, anyway) to boil down a whole novel into a few sentences. But let me try… On one level, it’s about a character discovering himself and his purpose in life. On another, it’s about the diminishment that old gods must feel as belief in them fades, and how they might react to that. It’s about the role of music in people’s lives. It’s about finding a home for yourself, even when where you find yourself is foreign to you. It’s about prejudice. It’s about family (and what creates a family). It’s about all those things and more. Read it, and you can give me your own definition! Where did the idea come from? Ultimately, it goes back to a trip I took to Ireland several years ago (and which also spawned the Cloudmages trilogy — HOLDER OF LIGHTNING, MAGE OF CLOUDS, and HEIR OF STONE, written under my “S.L. Farrell” pseudonym — the first books I wrote for DAW). I loved being there… and not just because Ireland is part of my heritage. But one incident in particular stuck with me. My sister and I climbed Diamond Hill in the Connemara National Park, and in looking out over the landscape before us with all these green hills and deep valleys and an ocean bay in the misty distance, a revelation hit me. Back in my college days as a Fine Arts student, I loved doing watercolors. Most of them were imagined landscapes; nothing I’d ever actually seen. Looking out over the Connemara landscape, I was seeing what I used to paint: the same steep, emerald-touched hills, the same walled valleys. I had the proverbial cliché shiver along my spine, and suddenly felt like I was home. I know, I know, that sounds incredibly corny, but it’s nonetheless true. Are there more books planned for the project? Not at this time. I planned the book, like my previous book IMMORTAL MUSE (which also has its mass market pb release this month), to be that rare beast: the standalone fantasy. However, astute readers might notice that there is a connection in CROW to other books of mine, and I won’t rule out following these characters in a future book, should fans clamor for that. But at the moment, no. When you close the book, you’re done. Music plays a significant role in this narrative and also in your life outside of writing. Tell us about the link between your writing and your musical endeavors. I’ve been writing since I was in grade school. I’ve also been playing guitar since about the same time, and for significant period in my life, I made my living as a musician. Strangely enough, though, I’ve never considered myself a songwriter. Yeah, I’ve written the occasional song (and still do), but composing music never grabbed me and refused to let go as has writing fiction. So as the bands broke up and I wearied of living out of a suitcase in strange hotel rooms with too many people in them, I gave most of my creative energy and attention to writing. Mind you, I still play music: some of the people I played with over the long decades are still in a band with me, and I occasionally do some ‘quiet’ gigs as a duo, and sometimes even an occasional solo gig, or you might find me in a music circle at a con. And one of my songs (well, at least the lyrics for it) appears in CROW. And I fully intend to sing a few songs from CROW at my readings. 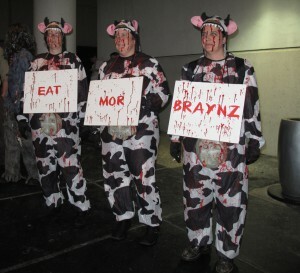 If that doesn’t scare people away, nothing will. A lot of your work touches on Celtic mythology and the link between ancestry and destiny. Do you feel that your writing is an expression of something in your familial background? Do you see it as a way of connecting with past generations? Not to be disingenuous, but I don’t know. I’m interested in history in general — a lot of my ‘pleasure’ reading is nonfiction history books, about any time or place that I find interesting — and that’s generally always reflected in my work. IMMORTAL MUSE, for instance, was a book with sections set anywhere from the late 1300s Paris to modern day New York City. I’ve been to France (and a lot of that trip is reflected in IMMORTAL MUSE); I’ve been to London and England a few times (and those trips are also reflected in my fiction). 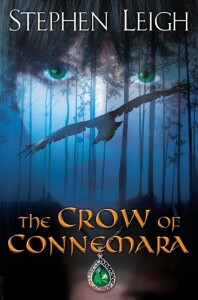 I’ve already spoke to how Ireland has influenced both the Cloudmages trilogy and CROW. So it’s probably less a ‘familial’ connection (though I do feel that with Ireland), but more that I like seeing and learning about different cultures and times than my own, and that interest, that research, and those experiences gets tangled up (to my pleasure and delight) in the creative process. But… touching on family, early in CROW (I don’t think this is so much that it demands a spoiler alert, but SKIP THIS PARAGRAPH if you really want to know nothing about the book before you read it. Seriously. Go on, we’ll wait.) So… As I was saying, touching on family, the father of Colin, the male protagonist, dies early in the book. Writing the initial draft was no issue, but in between that and the time that I was doing the revisions for the book, my own father passed away — not in the same way exactly, but under somewhat similar circumstances. Writing that section immediately following the death of my own father was… difficult. At a recent convention, I read that section and I had to stop a few times to stop my voice from breaking. Sometimes fiction cleaves too damn close to reality. You’ve written science fiction, epic fantasy, historical fantasy, YA, and now a tale that, in your own words, blends contemporary Celtic fantasy with tragic romance. Do you enjoy shifting among subgenres? Do you think it keeps your work fresh? And is there one genre in particular that you’re drawn to above the others? I don’t know that it keeps my work fresh, but it keeps me from getting bored as a writer — which is also one reason why the last two books have been standalone. I find that (and I speak only for myself), that by the time I finish three books set in the same place and general time, that I’m hungry to try something new and different. I don’t particularly want to go back there. For instance, when I started the Cloudmages series, I had an entire 12-book arc planned in my head, consisting of four separate trilogies which would follow that world through the entire centuries-long slow cycle of rising and falling magic… but by the time I finished the first trilogy, I really felt like I needed to do something different to recharge the creative batteries. I may even return to that world one day because I do love it and because there are things there I’m interested in exploring, but I’m also happy moving on. That’s also the case with the Nessantico series, which I thought I also might continue, but didn’t because I was much more interested in writing IMMORTAL MUSE. There are certainly writers who have written multiple books in the same universe, and are obviously still happy to be working there. There’s nothing at all wrong with that, and more power to ‘em. Like many sf/fantasy fans, sometimes I really enjoy going on that ’long ride’ with an author (for instance, David, I love your own “Thieftaker” series). I know fans like long series… but alas, I don’t think I’m a writer who can easily accommodate that. And someday, maybe, I might attempt a straight historical novel, or maybe an alternate history novel. Just because. What are you working on now? Where do you think your work will take you after the Connemara project? I already know what I’m doing next — in fact, I’ve already started on it. I have a two-book contract with DAW for a ‘duology’ (as opposed to a trilogy…). This one will be set in a world that will bear a resemblance to 1st century Britain under the Roman occupation, but it will not be that historical world (though much of my research into the period will go into the work, and some of the incidents in the novels will be drawn from actual historical encounters). This is a world where there is true magic, and where ghosts might be real, and the gods might actually get involved in the affairs of humans. So, yes, I suppose it’s another “Celtic” fantasy. The first book is tentatively entitled A FADING SUN, and the second will be A RISING MOON. The protagonists, in both cases, will be women (as, for some inexplicable reason, seems to be usually the case for me; CROW has two protagonists, one male and one female). Right now, I’m, oh, maybe a third of the way through the first draft of A FADING SUN. So it’ll be awhile before the first of the two appears in print. Between teaching at a local university and the rest of life interfering, I don’t qualify as a ‘fast’ writer. Thanks, though, for giving me the chance to natter away about my work and the writing life in your blog. I appreciate the opportunity, and I’m looking forward to seeing what your readers say! 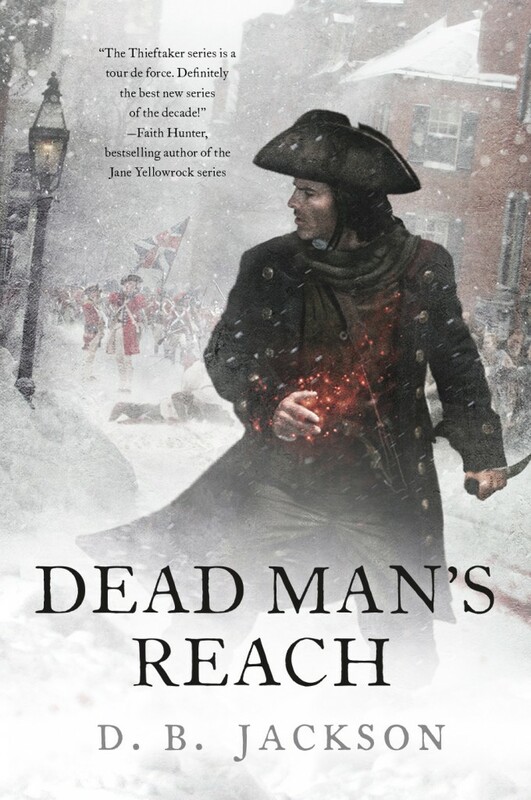 Today I finished reading through the first pass galley proofs of Dead Man’s Reach, the fourth and (for now) final book in the Thieftaker Chronicles (which I write as D.B. Jackson). There is really nothing left for me to do in terms of production for the novel. It will be released on July 21, 2015, and I really can’t wait. It is my favorite of the Thieftaker books and it may well be the finest novel I’ve ever written. And it also sports the best cover of the series, which is saying something because ALL of Chris McGrath‘s Thieftaker art has been magnificent. I mean, really: check this out. Amazing, right? This is one of those announcements that I just love to make: I am very pleased to say that I have been invited back to DragonCon as a guest (as D.B. Jackson, but I’ll be there promoting work under both my writing names). I will be speaking on panels, (perhaps) reading from my latest work, and selling books in the exhibitor’s hall in the Tairen’s Lair/Author’s Lair booth. So, I’ll be in Atlanta the weekend of September 4-7, Labor Day weekend. Hope to see many of you there. For more information about my 2015 appearances, please go to this page.